In 1865 Wellington finally received what many citizens had considered its birthright: the role of capital city. However, the town had little room for new growth. This led the provincial and central governments to jointly fund a 51-hectare reclamation of Lambton Harbour from Customhouse Quay to Pipitea Point. 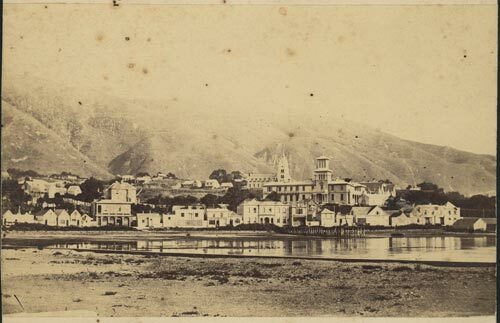 By the early 1870s the project had reached the northern end of Lambton Quay – identified in this photograph by the line of buildings along the water’s edge. The two-storey building with the tower is Government House (where the governor lived). Immediately behind is Parliament, with St Mary’s Catholic Church to the left.